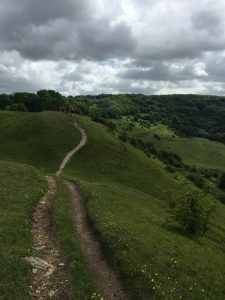 It wasn’t really in my plan to bore anyone to tears with yet another ‘race report’ that’s only really of interest to the person writing it, but I suppose that since the Cotswold Way 100 Mile Run is/was my ultrarunning swansong I should write a few notes. Now, for anyone contemplating a 100-mile race this is not for you. Much as I would have loved to have raced 100 miles I never had the courage and most certainly never had the self-belief that it would ever happen, hence I opted to tick the 100-mile box with a multi-day challenge option: 100 miles over four days, fully supported, with set mileage and camping overnight in runners’ villages and, best of all, no cut-off times to stress over. 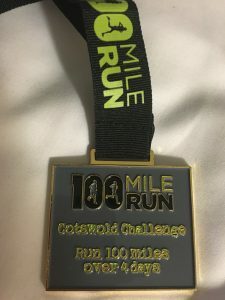 Many thanks to http://www.100milerun.com/cotswold-way-challenge/ for organising this challenge and looking after us all throughout. 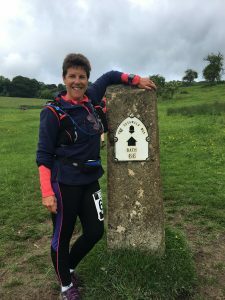 The route, of course, was the official Cotswold Way in its entirety – starting from Chipping Campden and finishing in the beautiful city of Bath. I always ALWAYS doubted I could do it, purely on the basis of how I felt every time I ran a trail of anything over 15 miles. I was in pain for three days afterwards, so how on earth was I going to do four in a row? The answer is simple – and purely psychological. You go out to run 10km you’ll be tiring by 7 km. You go out to run 20 km, you never really feel that same tired until around the 14km mark or thereabouts. It doesn’t enter your head to feel tired before then, so although my legs were always trashed after 15 miles this was not an option to ‘succumb to’ when I needed to do the same another three times. Simples. (b) I ditched my ‘walk one day’ option. Did I walk? Well, of course! Who doesn’t walk during an ultra (elites excluded)? But my strategy had been to walk at least one of the routes in an effort to save my legs for the final ultra on Day Four. Didn’t need to. I’ll put this down to sticking like glue to my training plan, on top of an amazing training base – gleaned over the winter and all thanks to the BTRS Trail Series ( http://brightontriathlonraceseries.co.uk/ ). Without that trail series, and the support of the BTRS friends and athletes, I would never have got out of bed and put in those miles on all those stormy, freezing and unsavoury days. And as for my training plan? Those peak three weekends of a 5-hour+ run on Saturday followed by 3-4 hours on Sunday were NOT FUN! I really did almost lose the will to live, but it’s all down to those toughies that I finished the 100 miles injury-free (apart from the obligatory loss of a few toenails). 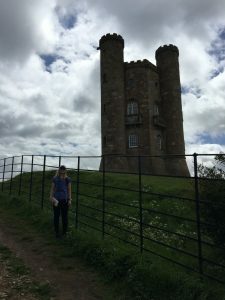 My most vivid training memory, however, was my delight at heading finally into the taper phase, a delight that rapidly evaporated when I looked at my first taper weekend – a run of THREE AND A HALF HOURS! For crying out loud! Did they misunderstand the word ‘taper’? Shortest run. Three big consecutive climbs. Job done. Took it very easy (although I only have one gear so you could say the same every day haha). I spent today with a young girl called Kate and we had a lovely few hours together. Scenery? Hilly and green. The villages were stunning – so much love and pride in those gardens – gorgeous. First night in a tent. Pretty much first night EVER in a tent. I claim the hashtag Born to Glamp. Definitely not born to camp. Now, just a few souls are privy to the story surrounding my first introduction to a tent and you’re not one of them. Sorry. There are some things that I just don’t want to go viral! I’ll save it for a drunken evening. That said, my lighter-than-light self-inflating air mattress was/is the best thing since sliced bread. Many thanks to http://www.pillow.co.uk/ who were in charge of all our accommodation needs. Special thanks to The Orchard tea room at http://www.haylesfruitfarm.co.uk/tea_room/ who saved my sanity with tea and served a fabulous dinner, too. Bravo on every level. Trip Advisor, here I come. After a great night’s sleep and a super breakfast I set off with Kate but soon found my legs and pulled away, making use of any ‘free’ miles that I could. I was nervous about a long run the second day and this was not an easy one, either. Today was physically the most challenging BUT … I made it. No villages today. Just trails. And a whole lot of green! Pretty and green. Greenly pretty? Whatever. You get the idea. I experimented with trekking poles today in a bid to save my legs a little. Did they do the job? Yes. Were they worth the effort? The jury’s still out. Today’s run was further enlivened by hundreds of runners from Race to the Tower – who were all running the same route as us but backwards (well, they weren’t running backwards – you know what I mean) – towards the first tower we reached on Day 1 (see pic). It was lovely to have so much company out on the course. Sleep was not particularly plentiful last night. I fully expected to wake up in a lake, since it rained torrentially all night and I think most of it came through my tent. Thank you Magnificent Air Mattress for saving me again. Shorter day today. I battled with trekking poles v. no trekking poles. I put them away and then missed them so I took them out again. Hmmmm. If yesterday was the most physically challenging then today was the mental challenge. So near and yet so far. Fortunately, I enjoyed the route today. No villages, but so much variation in terrain it helped boost interest and enjoyment. This was the day I’d planned to walk and I walked the first few miles but after that running was just easier (even if it was a jog). I spent quite a lot of today by myself. Because I ran more than walked today I was perplexed when I saw my Garmin stats – which were little more than crawling speed. 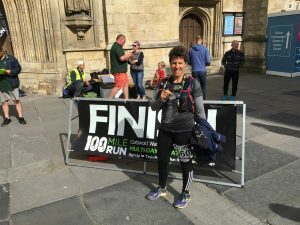 It took me forever to remember that the final five miles or so I’d hooked up with a trio of entertaining Scotsmen (one of whom was injured so they were walking) who then dragged me kicking and screaming into the pub for a pint a couple of miles before the finish – and I forgot to pause my Garmin! Oh woe is me! I had an awful night, mostly stressing about today’s ultra. I didn’t think I’d make it, my toes were throbbing – bruised, battered, black and blue. The Negative Committee was out in full force. 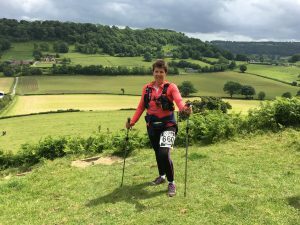 I woke up and cried, then cried when I put my trainers on, picturing myself hobbling 33 miles. Then I discovered that breakfast, which was supposed to be at 7.30 a.m., had opened up early without any announcement. The queue was already mile long (no exaggeration at all there!) and I decided to skip it. So while I was sitting on a bench with a face like thunder and wallowing in my own misery and levels of pathetic that humanity has rarely witnessed, a lovely lad (who just happened to have run across Canada the previous year – as one does) sat down beside me and said he’d noticed me hobbling and could he suggest I take out my shoelaces and do them up a different way? As only the best Borgs do, I complied. I had the BEST RUN OF ALL! Not only that, I think I ran (mostly due to the loveliest and wonderful-est running buddy Lisa) the entire route – barring the obligatory walks on hills. The sun came out and thankfully there were lots and LOTS of free miles to be had today. We crossed that finish line together and oh did that feel GOOD! That air mattress – YES! Spotless portaloos and general bathroom facilities. A notice board with timetable of events would have made life easier. What a way to finish. I’ve done a few and seen some glorious places I would never have otherwise visited. Now it is time to bow out graciously (with a few battered toes). 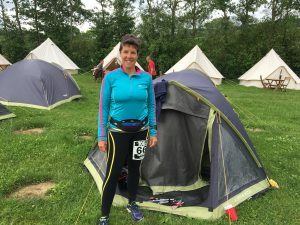 With thanks to the world of Ultrarunning for the adventures and proving time and again that finish lines really are more important that finish times (thankfully) – and I am capable of more than I think. For this lifetime, however, I bid you adieu.